Don't get me started on the Bruiser. He was voted "Most Likely to Get the Death Penalty" by the entire school. He's the kid no one knows, no one talks to, and everyone hears disturbing rumors about. So why is my sister, Brontë, dating him? One of these days she's going to take in the wrong stray dog, and it's not going to end well. My brother has no right to talk about Brewster that way—no right to threaten him. There's a reason why Brewster can't have friends—why he can't care about too many people. Because when he cares about you, things start to happen. Impossible things that can't be explained. I know, because they're happening to me. Award-winning author Neal Shusterman has crafted a chilling and unforgettable novel about the power of unconditional friendship, the complex gear workings of a family, and the sacrifices we endure for the people we love. Bruiser completely blindsided me. I hadn't even seen a copy on the shelf when an author recommended it mere days before Brilliance Audio offered to send it to me. It was a more intense and emotional book than I ever expected, not only because of the emotions the characters experience but the ones they don't. What if you didn't have to feel the bad in life? And if you didn't would you ever want it back? Is a carefree existence all it's cracked up to be? Brewster Rawlins, known to most as "Bruiser", has a reputation. People spread rumors but he's given a wide berth a school, so when Brontë starting dating him her twin brother Tennyson, who's kind of the macho jock, flips his wig. No one, including Tennyson, knows anything about Brewster or his life, but they assume and freely. Tennyson is convinced he's dangerous and determined to drive him away from Brontë. He sets out to investigate Brew in hopes of digging up the real dirt. Instead, he learns that Brew has taken more pain in his life than he's inflicted and doesn't get close to people because of it. For Brew, caring has consequences, and being alone is safer than letting someone get too close. It isn't until Brew lets Brontë and Tennyson into his heart that they learn exactly how dangerous it is for him to have friends. At first Brew's secret seems like a gift, but Tennyson and Brontë will have to face their own lives and take back everything that was taken from them if they want to save Brew. Even if it hurts. Narration by Nick Poedehl (of Will Grayson, Will Grayson), Kate Rudd ( of Tithe), Luke Daniels (of This Dark Endeavor), and Laura Hamilton is superb. The four-part narration makes this story of sacrificing yourself for the ones you love feel incredibly three-dimensional. I have to admit that four points of view was a little hard to keep up with at first even though the characters announce themselves at the beginning of each chapter. Sometimes there was no telling who was coming next and there were a lot of observations, opinions, and periphery relationships to keep up with, but after the second or third rotation I had adjusted. Though I love all of the four, I think Tennyson was my favorite character with a POV. However, Brew's were the most interesting because they are lyrical and had the most depth of emotion. In the hardcover, his chapters are all written a bit like poetry with stanzas and very specific formatting. They feel so immensely personal that at times they feel like diary entries. As a predominantly paranormal reader, the thing that surprises me most about Bruiser is the it is very nearly genreless. It's not literary per say but it has contemporary setting with aspects of magical realism or the paranormal. All of it works well together and no one thing holds so much of the focus that it takes away from the story. This was one of my absolute favorite Shusterman books. An idea like this could have easily been over the top and melodramatic, but instead it was heartfelt without being treacly. Such a great book. Wonderful review. 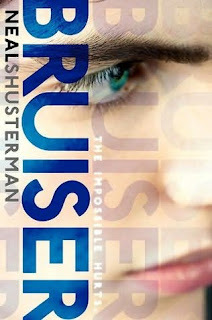 I read and loved Shusterman's Skinjacker trilogy and this one sounds amazing. Its definitely going on my to-buy list. What am I reading in September? Whatever I want! There's no obligation in blogging.